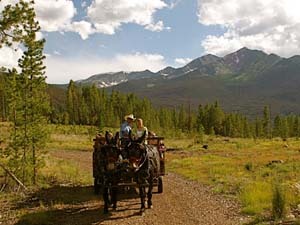 In the Winter Park area family fun is going to an old fashioned chuck wagon and dinner ride. Enjoy an evening of horseshoes, a gaming corral, and a wild west show. You will not only be entertained, but will have beautiful views of the Rocky Mountains of Winter Park's surrounding area and a real BBQ. Great for family reunions, birthdays, corporate events, rehearsal dinners and just about anything else you can imagine. The High Country Stampede Rodeo, where everyone has fun!